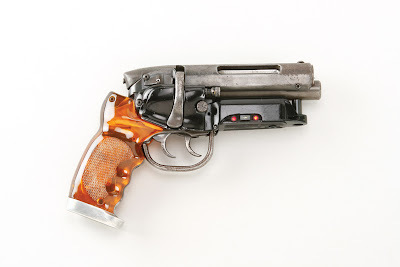 Rick Deckard's laser blaster, pistol zapper thingy is up for auction over at Profiles in History. For somewhere in the 6-figure range you can run around your apartment pretending to hunt vicious androids with a prop that was in a movie! 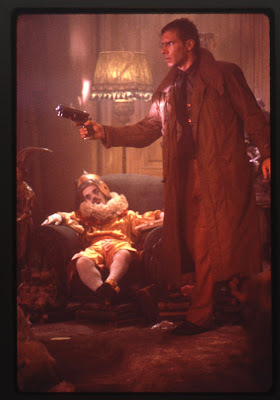 But damn if that gun doesn't steal one scene: you know the one where all you see is the gun against the wall as Deckard hunts Batty, and Batty says. "Come on Deckard, show me what you're made of." Good stuff. "(Warner Bros., 1982) Arguably one of the single most important weapons in Science Fiction history is the hero firing blaster used by Rick Deckard (Harrison Ford) to "retire" replicants in Ridley Scott's timeless Sci-Fi classic Blade Runner. While few rubber stunt guns have surfaced in the collector's market over the years, this particular Hero-blaster has been thought to have been lost for decades. Purchased by Hollywood Marketing specialist Jeff Walker, in a sale by the film's production company after filming had wrapped, this iconic piece has been in Walker's private collection for over 25 years. It was briefly displayed at a convention around the time of Blade Runner's 25th Anniversary and immediately caused a frenzy among Sci Fi fans, who had never thought to ever see the “holy grail” of Sci-Fi weapons in person. Only one hero firing weapon was made for the production which was created by mating a Steyr-Mannlicher Model .222 SL receiver on to a Charter Arms .44 police bulldog double-action revolver. It features custom amber grips, dual triggers, and futuristic illuminating LEDs (four red and two green) that can be activated by a small switch mounted beneath the barrel. Besides its cult-classic status and tremendous re-release success on its 25th Anniversary, Blade Runner is a leading example of the neo-noir genre and is regarded by its director as one of his most complete and personal films. It has been selected by the Library of Congress as being "culturally, historically or aesthetically significant". It is also ranked by the American Film Institute and Time Magazine as one of the “100 All-TIME best movies” and the popular British movie magazine Empire voted it the "Best Science Fiction Film Ever" in 2007. This blaster is most likely the most representative artifact for this important contribution to cinematic history."